Home > Research > 170 Million in U.S. Drink Radioactive Tap Water. Trump Nominee Faked Data to Hide Cancer Risk. UPDATE: On Feb. 4, the White House withdrew Kathleen Hartnett White’s nomination to head the Council on Environmental Quality. A new nominee has not been named. Is radiation found in your water system? How does radiation get in drinking water? Does the federal government regulate radiation in drinking water? How did Trump’s enviroment czar nominee downplay risks? How can you protect yourself from radiation in drinking water? The nominee, Kathleen Hartnett White, former chair of the Texas Commission on Environmental Quality, admitted in a 2011 interview that the commission falsified data to make it appear that communities with excessive radiation levels were below the EPA's limit. She said she did not "believe the science of health effects" to which the EPA subscribes, placing "far more trust" in the work of the TCEQ, which has a reputation of setting polluter-friendly state standards and casually enforcing federal standards. EWG's Tap Water Database compiles results of water quality tests for almost 50,000 utilities nationwide. 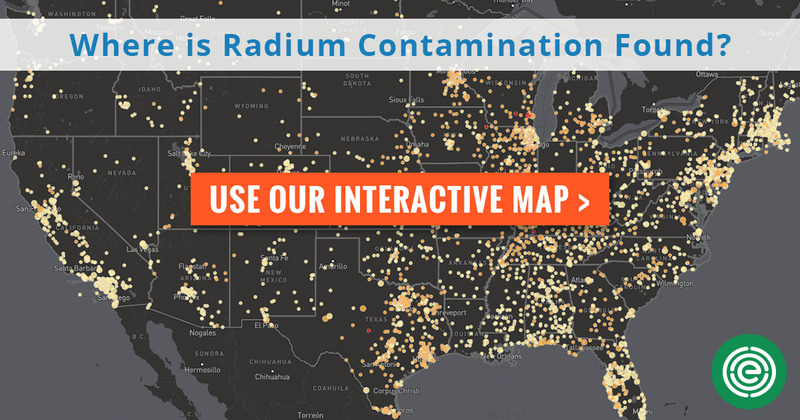 EWG also mapped the nationwide occurrence of radium, the most common radioactive element found in tap water. From 2010 to 2015, more than 22,000 utilities serving over 170 million people in all 50 states reported the presence of radium in their water. A 2011 investigation by KHOU-TV of Houston unearthed TCEQ emails documenting the deception. Instead of reporting the levels measured in laboratory tests, TCEQ would first subtract the test's margin of error. Because TCEQ’s falsifying of data made it appear that the system met EPA standards, the system did not have to inform its customers that their tap water contained dangerous levels of radiation. In 2001, TCEQ reported to top state officials – including Hartnett White and then-Gov. Rick Perry, now Trump's energy secretary – that some types of radiation in the tap water of some Texas communities posed an increased lifetime cancer risk of 1 in 400. The EPA’s increased lifetime cancer risk for five types of radioactive elements ranges from 2 to 7 in 100,000. But the practice continued until 2008, after an EPA audit caught the state cooking the books. KHOU investigative reporter Mark Greenblatt pressed Hartnett White: "But what if you're wrong? What if you're wrong and EPA's right about there being a danger?" "It would be . . . it would be regrettable," she replied. In October, Trump nominated Hartnett White, now a fellow at the Texas Public Policy Foundation, to head the White House Council on Environmental Quality, which coordinates environmental policy for all federal agencies. One of its major responsibilities is "to develop and recommend national policies to the President that promote the improvement of environmental quality and meet the Nation's goals." In November, in her confirmation hearing before the Senate Environment and Public Works Committee, she characterized TCEQ's falsification of data as "one of these technical issues" and declared: "I would never, ever tell staff to underreport health hazards." In her written responses to follow-up questions from the committee, Hartnett White said she was “aware of the EPA’s interpretation of its rule,” but that she did not "recall EPA telling TCEQ during my tenure there that TCEQ’s methodology was not legal." But KHOU's investigation documented that in June 2004 the EPA warned the TCEQ if it did not stop the falsification, the federal agency could take over regulation of the state's water systems. If radiation is detected in your water, consider buying a water filter. Radiation can be difficult to remove, and the type of filter you need will depend on the form of radioactivity detected. Radon and tritium volatilize from hot water, making bathing a greater source of exposure than drinking water. EWG’s water filter guide includes filters certified to remove radium. Activated carbon technology works best to reduce radon and strontium, and reverse osmosis may be the most effective technology for uranium.